With so Many Different Types, You’ll Never Get Bored! Mochi isn’t just a passing fad in its home country, Japan, but a different way of eating food. Here, what we know is the sweet little balls of rice with ice cream centers that could rule the world if they had little swords and shields, but there is more to mochi than the sweet frozen treats that we know here in the United States. Mochi in any form is normally topped with something starchy to make it easier to eat with your hands, but some simply necessitate the use of forks or dessert sticks. 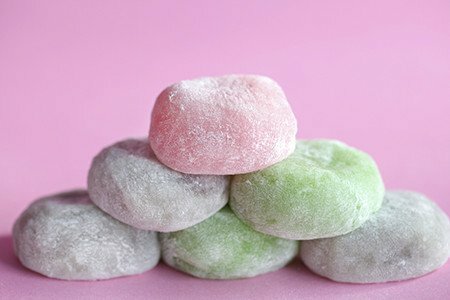 While mochi ice cream is made by a variety of ice cream companies, both inside and outside of Japan, it is probably the best-known dessert to come out of Japan. With the variety of flavors available, some specific to the country, you won’t run out of interesting and exciting options. Red bean, black sesame, mango, and plum wine are flavors that are popular throughout Japan, and make delicious ends to any meal. Daifuku has a several different ways of being served, but most are filled with sweet paste, and a whole, juicy strawberry. Some daifuku is filled with cake and whipped cream, and some are flavored with different sweet pastes. As many varieties of daifuku as are available, it could be in a category all its own, but it is prepared and eaten the same way as mochi, so it easily fits under the mochi umbrella. Daifuku is also filled with white or red bean paste. A sweet dessert soup made from red beans, it is topped with mochi, and a dessert favorite throughout Japan and Taiwan. Served warm with a spoon, oshiruko behaves like a soup, and satisfies like a candy. As the name would insinuate, kusa mochi is flavored with kusa, a wild grass that is alternately shunned as a root, and used in medicine across Europe and Asia. The flavor is grassy, and reminiscent of strong green teas, and is used at tea ceremonies. Blocks of mochi that are toasted, topped with bean sprouts, or more frequently, used in stews and soups. It is possible (and commonplace) to top kirimochi with something sweet, but this doesn’t happen as frequently as using it as a savory snack, or part of a meal. Plain kirimochi can be wrapped in soy paper, dipped in sauce, and enjoyed that way. While Udon itself is easy to find with or without mochi, Chikara Udon is the type that will always include mochi. One could even add more mochi to their udon, as it can take on a bit of the flavor of the traditional fish broth. Dango is a traditional dumpling made from a starch called mochiko, the same component of ice cream mochi. Though dango has many of the same components, it is not officially mochi. Usually served at Cherry Blossom festivals, sakura mochi is pink, just like cherry blossoms, and filled with anko, or red bean paste. Wrapped in a pickled sakura leaf, the handheld delight is a sweet-salty-bitter combination.